When you cannot comply with an ATC clearance, the magic word to use is “unable”. Simply saying “unable”, and nothing else, might not get you completely off the hook with ATC. I’ll explain why, and what to do about in this month’s edition of IFR Flight Radio. UNABLE− Indicates inability to comply with a specific instruction, request, or clearance. § 91.185 IFR operations: Two-way radio communications failure. If you have ever departed IFR from an uncontrolled airport, ATC probably gave you a Clearance Void Time. The controller said to you, for example, “Void if not off by 10:15, time now 10:01 and one half. Basically, this meant ATC had approved your takeoff any time before the Clearance Void Time on 10:15 Zulu. Here’s your question. What is a “Release Time” and how might ATC use it for your flight? I’ll have the answer to that question, along with more topics to help you work with ATC while flying IFR, in the next edition of the IFR Flight Radio Show. Uh oh. A fire hose of information is about to come across the radio. Are you ready to take it all in and write it down? I would argue, copying a full route IFR clearance is one of the hardest communication skills pilots face. The problem boils down to: Can you listen, comprehend and translate the clearance to paper at the same pace as the controller gives it to you? In this show, I’m going to reveal how to completely circumvent the problem and get your clearance copied correctly. I’ll show you how to do this no matter how complicated the clearance. 2. If it reduces verbiage, state the phrase: “Cleared to (destination) airport, or cleared NAVAID, intersection, or waypoint (type if known), (SID name and number and SID transition, as appropriate), then as filed, except …” Specify the necessary revision. You are flying northeast on Victor Airway 17 between the San Antonio Vortac and the Centex Vortac. The controller at Houston Center says, “Cessna 30 Delta, turn right 20 degrees, vectors for traffic.” As you turn to the right, you read back, “Cessna 30 Delta, right 20 degrees.” The controller follows up with, “Cessna 30 Delta, expect direct . . .” And then the radio goes silent. Since that next transmission was cut off, you say, “Cessna 30 Delta, say again.” There’s no response. In fact, you hear no other transmissions from the controller or from other aircraft. You look at your radio control heads and notice the entire stack of radios and your transponder appears unpowered. You try contacting Houston Center again and not only do you not get reply, you can’t even hear a sidetone of your own voice as you transmit. You run through every procedure you can think of to revive your radios but nothing works, and you do not have a portable battery operated radio on board to act as a backup. Without question, you are radio out, or NORDO if you prefer. At this point, do you turn left to rejoin Victor 17 and continue along your previously cleared route of flight, or do you turn left and proceed from your present position direct to the Centex Vortac? I’ll have the answer to that question, along with a full explanation in the next edition of the IFR Flight Radio Show. You are taking radar vectors to an ILS approach. The controller points out traffic you are following. You report the traffic in sight. ATC tells you to follow the traffic and clears you for a visual approach. Two minutes later, you lose sight of the traffic you were supposed to follow. We can talk all day about the correct way to use your call sign in a radio transmission. All that talk doesn’t add up to a hill of beans if pilots aren’t using their call sign at all when talking to ATC. The answer to the Question of the Week asked in your last show, plus a brand new question to ponder. 1. Do not clear an aircraft for a visual approach unless reported weather at the airport is ceiling at or above 1,000 feet and visibility is 3 miles or greater. 2. Issue visual approach clearance when the pilot reports sighting either the airport or a preceding aircraft which is to be followed. 3. Provide separation except when visual separation is being applied by the pilot. 4. Continue flight following and traffic in- formation until the aircraft has landed or has been instructed to change to advisory frequency. 5. Inform the pilot when the preceding aircraft is a heavy. 6. When weather is available for the destination airport, do not initiate a vector for a visual approach unless the reported ceiling at the airport is 500 feet or more above the MVA and visibility is 3 miles or more. If vectoring weather minima are not available but weather at the airport is ceiling at or above 1,000 feet and visibility of 3 miles or greater, visual approaches may still be conducted. 5. Advise ATC immediately if the pilot is unable to continue following the preceding aircraft, cannot remain clear of clouds, needs to climb, or loses sight of the airport. You are on a long, wide base leg, taking radar vectors to an ILS approach. The approach controller asks you if you have the airport in sight. You do have the airport in sight but due to hazy visibility you don’t see the landing runway. You know if you report the airport in sight, the controller is probably going to clear you for the visual approach. Due to your lack of orientation to the runway, you would prefer to continue with radar vectors to intercept the ILS. Do you have the option to continue with vectors to the ILS approach even if you have the airport in sight? If so, what would you say to the approach controller? I’ll have the answers to those questions, along with a full explanation, in your next edition of the IFR Flight Radio Show. If you are in the process of researching a new radio headset, check out my Headset Buyer’s Guide at ATCcommunication.com. Cutting a corner by requesting direct to a point further along your route of flight could save time and fuel. An enroute air traffic controller will try to honor your request if circumstances permit. First and foremost it pays to know how to make a request direct to a point. We’ll discuss all the particulars of requesting direct in this edition of the IFR Flight Radio Show. c. Pilots have the privilege of requesting a different clearance from that which has been issued by ATC if they feel that they have information which would make another course of action more practicable or if aircraft equipment limitations or company procedures forbid compliance with the clearance issued. 4. Increasing use of self-contained airborne navigational systems which do not rely on the VOR/VORTAC/TACAN system has resulted in pilot requests for direct routes which exceed NAVAID service volume limits. These direct route requests will be approved only in a radar environment, with approval based on pilot responsibility for navigation on the authorized direct route. 3. Issue a clearance “direct” to a point on the previously issued route. 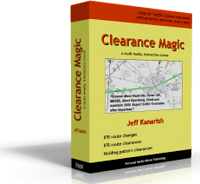 Clearances authorizing “direct” to a point on a previously issued route do not require the phrase “rest of route unchanged.” However, it must be understood where the previously cleared route is resumed. When necessary, “rest of route unchanged” may be used to clarify routing. 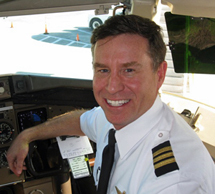 Check out the Headset Buyer’s Guide at ATCcommunication.com for help choosing an aviation radio headset. You are flying at your filed cruise altitude on a Victor Airway 159 inbound to the Ocala Vortac in North Central Florida. After crossing over the top of Ocala, your cleared route of flight has you making a 46-degree turn to the right to continue on Victor 441 to the Gainesville VORTAC*. With 30 miles to go to the Ocala VORTAC, you decide you’d like to save time and fuel by proceeding direct Gainesville. Checking your enroute chart (see the chart segment above), given your present position, even if you cut the corner and proceed direct right now, your new route of flight will keep you well clear of the Palatka MOAs northeast of your position. Four minutes pass. The controller has said nothing further to you about your request to proceed direct Gainesville*. Instead, he says, “Skyhawk 30 Delta, contact Jacksonville Center on 127.8.” Here are your questions. First, why do you think the controller never approved your request? Second, will you have to make the same request of your next controller, or will he have your request in his todo list when you check in. I’ll have the answers along with complete explanations in your next show. In this week’s question, I incorrectly identify the Gators VORTAC as the Gainesville VORTAC. I graduated from the University of Florida at Gainesville, so one of two things is true. Either my education was inadequate, or I recalled the name of the VORTAC as it was _____ years ago when I attended college. If your IFR training was like mine, you spent a lot of time taking radar vectors to instrument approaches using approach control service. Less time was spent working with enroute center controllers. Communicating with an enroute controller at an air route traffic control center (ARTCC) is its own special skill. In today’s show, we’ll look at ARTCC communication during traffic avoidance vectors and during radar handoffs. 2. An ARTCC is divided into sectors. Each sector is handled by one or a team of controllers and has its own sector discrete frequency. As a flight progresses from one sector to another, the pilot is requested to change to the appropriate sector discrete frequency. Notice how the following statement in the AIM has no requirement to repeat the numbers of an assigned radio frequency. d. Acknowledgement of Frequency Changes. 1. When advised by ATC to change frequencies, acknowledge the instruction. If you select the new frequency without an acknowledgement, the controller’s workload is increased because there is no way of knowing whether you received the instruction or have had radio communications failure. Trying to decide which radio headset to buy? Check out my Headset Buyer’s Guide at ATCcommunication.com. How good are you at hanging on to an ATC clearance that is long and complicated? In this week’s edition of IFR Flight Radio, I’ll give you tips and techniques for recording and reading back a long, complicated ATC clearance. We’ll consider the answer to the Question of Week presented in our last show. I’ll also have a brand new Question of the Week for you to chew on. Pull the chocks and get ready to taxi. IFR Flight Radio’s is on the move again. (1) Vertically and laterally navigate on a STAR/RNAV STAR/FMSP. (2) When cleared to a waypoint depicted on a STAR/RNAV STAR/FMSP, to descend from a previously assigned altitude at pilot’s discretion to the altitude depicted for that waypoint, and once established on the depicted arrival, to navigate laterally and vertically to meet all published restrictions. Do you know what you are required to read back when ATC issues a clearance to you? Apparently a lot of pilots–including high-time pros–don’t know what they are required to read back. A contact of mine at Chicago Approach Control said he is pulling his hair out because many pilots do not read back his clearances as expected. He asked me if there are any regs to control what and how a pilot reads back an ATC clearance. Here’s my answer to him in the very first episode of the IFR Flight Radio Show. Questions? Write to me at Jeff@ATCcommunication.com. Or add a comment below the notes for this show. Or follow me at https://twitter.com/atc_jeff. 91.123 Compliance with ATC clearances and instructions. Pilots of airborne aircraft should read back those parts of ATC clearances and instructions containing altitude assignments, vectors, or runway assignments as a means of mutual verification. The read back of the “numbers” serves as a double check between pilots and controllers and reduces the kinds of communications errors that occur when a number is either “misheard” or is incorrect. You are inbound to an airport with a published Standard Terminal Arrival called the Candy Five. As you approach the VORTAC the defines the beginning of the arrival, the controller at Chicago Center says, “Twin Cessna 553 UM, proceed via the Candy 5. Descend and maintain 9,000.” You readback this clearance and navigate along the route for the Candy 5. You also begin a descent to 9,000. Then you notice, 20 miles ahead there is an intersection with a published crossing restriction of 8,000 feet. Would you descend to cross that intersection at 8,000? *I receive a small commission when you use this link to make a purchase at Amazon.com. You know how long it takes to write a book that makes that claim? A year and a half. How long did I think it would take? Oh, only about 6 months. I missed my deadline by 1 year. In geological time that’s a blink of an eye. It was worth it though. In that time, I got some great help from pilots, certified flight instructors, and certified professional controllers. Even the FAA chimed in on one topic. That will make you a pro communicator on the radio. Update for Oct 31: The “Search Inside this Book” feature has been added to the listing at Amazon.com The listing for the book at Amazon.com just went online today (Oct 26). They have yet to add the full “Search Inside this Book” feature to the listing. If you would like a peak inside portions of the book that aren’t shown at Amazon.com, you can do it right here. *The fine print: I earn a commission from Amazon.com when you use this link to order. Is your radio vocabulary littered with garbage? 5.”And” is one of those filler sounds, similar to “Uh” and “Um” that sprinkles some pilots’ vocabularies. It’s a lousy habit. The only cure is to become conscious of it and cut it out. 4.”With you.” Really?! Where else would this pilot be? Floating on the fifth plain of consciousness, phoning it in by mental telepathy? You hear this extraneous phrase so often from pilots you’d swear it was in the AIM’s Pilot/Controller Glossary. 3. “At this time.” Huh. I could have sworn the air traffic controller asked the pilot to say his heading. He must have thought the controller asked him what he thought his heading will be further along the space-time continuum. 2. “With a request.” Oh, I’m sorry. Didn’t the pilot think his controller was listening to his frequency? After all, that’s a controller’s job. What’s that? You think he was just trying to be courteous? You know what would be courteous? If he quit tying up the radio with an extra radio transmission and just made his request. Seriously, I’ve asked several controllers what they think about pilots saying, “With a request.” Most don’t care for it. They consider it a poke in the ribs that they don’t need. They all told me, if you have a request, make it without an introduction. Note the difference between this and a generic wake-up call. Stating the nature of your request has substance that helps the controller prepare. Simply saying, “With a request” is uninformative, unnecessary, and maybe a little insulting. 1. “Whatta ya need?” No kidding, the conversation above represents an actual radio exchange I heard recently. I know, and most air traffic controllers know, a pilot who says, “Whatta ya need?” is trying to sound cooperative. Controllers already know pilots will cooperate with them. The real problem with “Whatta ya need?” is it forces the controller to reply. In most cases, when a controller asks a pilot about his speed, it’s to help the controller plan his spacing between aircraft. The controller needs a moment to think, not reply. I’m not trying to sound like a grumpy old pilot. “Hey you brats! Get off my lawn or I’ll call the cops!” The point of this exercise is to get you thinking about streamlining your transmissions. There are words and phrases that have crept into the pilot vocabulary which take up time on the radio and accomplish nothing. Take a moment to analyze your own repertoire of responses to ATC. Is there anything you say that is fluff? If so, I recommend cutting those time-wasting phrases off at the knees. If you recognize that an aviation frequency is a time-share commodity, then make a conscious effort to be efficient on the radio. Yes, I know you’re IFR. Yes, I know ATC has you covered with traffic advisories and alerts. Yes, I know you have TCAS or ADS-B In. It wasn’t nearly this close, but it still got our attention. When you’re in VMC, keep clearing for traffic. You wouldn’t believe what can pop up as unannounced traffic, in the most unexpected place. I wrote about a surprise encounter with a VFR aircraft at ATCcommunication.com. P.S. When ATC says, “Turn right immediately,” turn right immediately.